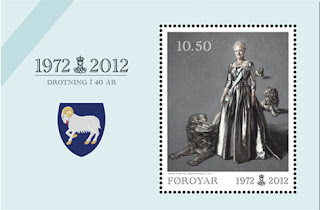 Faroese Stamps: Queen Margrethe II – 40 years on the throne. 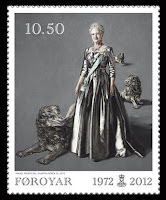 On 14 January 2012, forty years have passed since Her Majesty Queen Margrethe II became Queen of Denmark. Queen Margrethe is the constitutional head of the Kingdom of Denmark, which includes Denmark and the two autonomous regions: Greenland and the Faroe Islands. On this occasion the Faroese Posta, Post Denmark and Post Greenland issue a common stamp sheet. Queen Margrethe was born on 16 April 1940 at Amalienborg Palace in Copenhagen. Her parents were Crown Prince Frederik, later King Frederik IX, and Crown Princess Ingrid. In 1944 and 1946 the couple had two more daughters, respectively Princess Benedikte and Princess Anne-Marie of Denmark. Princess Margrethe was babtized in Holmen Church in Copenhagen on 14 May 1940. Her full name was Margrethe Alexandrine Þórhildur Ingrid. At that time, female succession to the throne was not an option, so not until the introduction of the Act of Succession of 27 March 1953, Princess Margrethe became Crown Princess of Denmark and heir to the throne. On 16 April 1958, Crown Princess Margrethe took seat in the State Council and served as head of State Council meetings when her father King Frederik IX was absent. The young Princess Margrethe received her primary school education at Zahle’s School in Copenhagen from 1946 to 1955. The first couple of years though, the education took place at Amalienborg Palace. After a short stay at boarding school in England (1955-56), she started on her high school education and graduated from Zahle’s School in 1959. In 1960 Crown Princess Margrethe took the obligatory examination in philosophy at the University of Copenhagen. In 1960-61 she attended studies in archeology at the University of Cambridge in England. In the period 1961-62 Margrethe studied political science at University of Århus, in 1963 she studied in Sorbonne, France and in 1965 at the London School of Economics. In 1967 Crown Princess Margrethe married the French diplomat Henri Marie Jean André Count de Laborde de Monpezat, who by this marriage became Prince Henrik of Denmark. They had two sons, Crown Prince Frederik, born on 26 May 1968, and Prince Joakim, born on 7 June 1969. On 14 January 1972 King Frederik IX died. The next day, the Crown Princess was hailed as Queen Margrethe II by Prime Minister Jens Otto Krag at Christiansborg Castle Square. 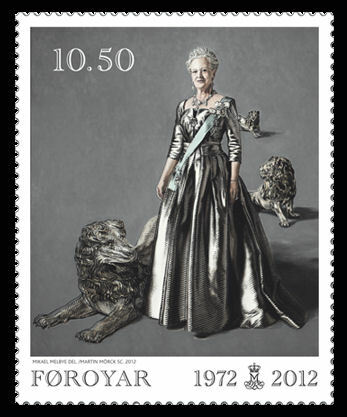 Her Majesty Queen Margrethe II is the constitutional Head of State of Denmark, Greenland and the Faroe Islands. This means that she as a ruler has no political powers or influence – these lies with the democratically elected parliaments. When time calls for elections to the Danish Parliament, the Prime Minister visits the Queen, submits his resignation and recommends general elections. When the elections are over, the Queen calls for a so-called Queen’s Round, where two representatives from each elected party visit her at Amalienborg Palace and recommend a leader for new government negotiations. This person will then be summoned and appointed formal negotiator. When the political parties in question have made an agreement for the terms of a new government, the new Prime Minister and his/her team of ministers visit the Queen again for the official approval. Once a week the Danish State Council is held, where the Queen meets the Prime Minister and Government. At this council the Queen or her deputy is informed of the Government’s work. It is also at this meeting that the Queen signs new laws together with the responsible ministers. Every year on 31 December, Queen Margrethe delivers the so-called New Year Speech, which is broadcasted live in Denmark, the Faroe Islands and Greenland. With this speech the Queen makes status over the year that has passed. This tradition is very popular, and although it is not a political speech, it may contain a remark or two of humanitarian or moral character. As Head of State, it is the Queen’s duty to preside at formal State Visits, both when she makes official visits to other countries and when foreign Head of States visit Denmark. The Queen of Denmark is formally the head of the Danish Army. It is also the Queen who formally welcomes foreign ambassadors, when they arrive in Denmark. Additionally, the Queen performs some representative tasks in connection with anniversaries, inaugurations, premieres, award of orders, etc. Each year the Queen performs a so-called Summer Cruise to Danish cities – mostly with the royal yacht “Dannebrog”. At regular intervals, the summer cruise also includes visits to the Faroe Islands and Greenland. Great numbers of people meet the Queen at her arrivals, and indicate the Queen’s popularity in the three countries. Since 1380, the Faroe Islands have been part of the Kingdom of Denmark -first as a part of Norway, then with direct connection to Denmark. Although the progress has developed into greater political autonomy, Queen Margrethe is very popular among the Faroese population, who have followed her since her first visit on the islands as a child. First with her father, King Frederik IX, and later in her capacity as Queen with her own family. The Queen’s insight into Faroese relations and history is highly appreciated and there is no doubt that a large proportion of the population looks forward to her traditional summer visits. Queen Margrethe II is the Queen of the Faroese as well as the Greenlanders and Danes, no doubt about that.